If you’re on a diet, or 3D gives you a headache, then Day 4 is for you! Need some choice material for your next book report, or just looking to curl up by the fire with a good read? Check out Xochitl Oliva’s “Scary Stories for Monsters Large and Small,” a comprehensive reading list compiled by an ACTUAL LIBRARIAN. Yes, this one’s professionally certified! From spooky picture books for your tiny tots, to chilling tomes for the grownups (including a certain popular zombie book), Xochitl’s got your literary needs covered. But wait, there’s more! You can also download cut+color Monster Mash Puppet Crafts designed by Juliana Sankaran-Felix. You get TWO features in ONE day! 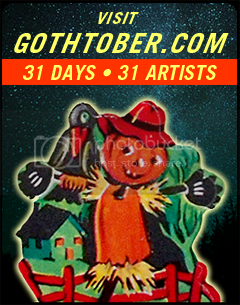 Now, that’s the value-added service you’ve come to expect from Gothtober. Enjoy!